Sketch of the beautiful occurence. The Moon a few seconds before occulting Venus. Weather: Bad. Seeing 2/10. Light pollution. Clouds oncoming. Tooling: Scan and GIMP2 working. 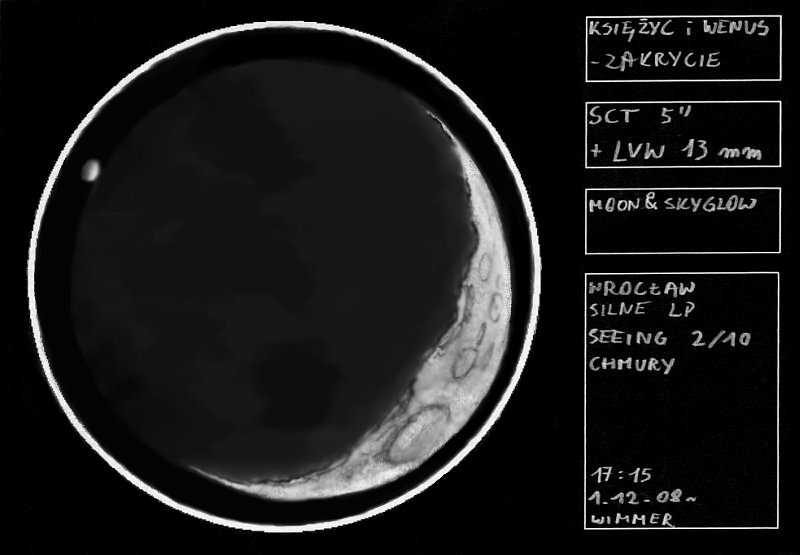 Webmaster’s note: I’ve got a few days worth of excellent sketches of this wonderful occultation that I think you’ll all enjoy. Wow! Yet another impressive sketch of the moon with Venus. Earthshine is wonderfully done. What a fantastic sketch. Frank is spot on with his description your capture of the Earthshine is wonderful. Its amazing to see how people go about sketching in such different ways.